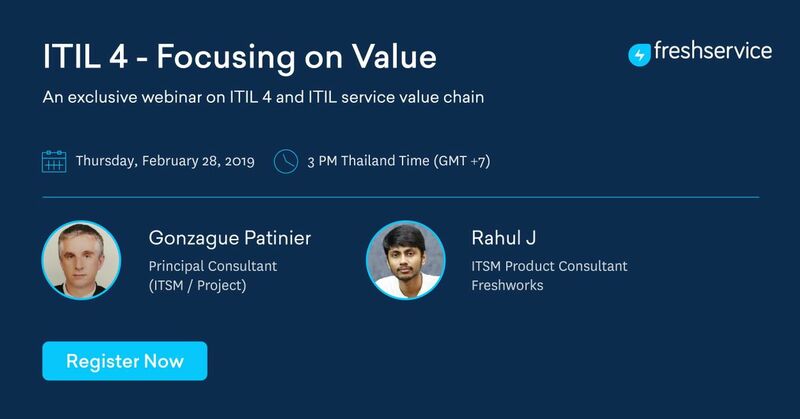 An exclusive webinar on one of the most researched topics in the ITSM world - ITIL 4 and ITIL service value chain. About the Webinar:This Webinar promises to update you on the latest development in the last version of ITIL (4). Our speakers with their years of ITSM experience will tell you the tips and tricks to get your organization to refocus on delivery value to your organization. This is bound to help Organisations implement ITIL processes with double the ease and drive change management effectively for rapid adoption. We have brought together, two of our leading ITIL/ experts onboard. They would make you sail through this IT transformation, through their years of guided expertise in this field. So what are you waiting for? Save your seat and make sure you don’t miss it. Why 'Focusing on Value' is important? Leverage on established platform for global online business now!